It's impossible to describe this show with one word, but the closest would be. And im not just talking about this season, but the show as a whole. It starts of with a bang, like these kind of animes usually do. With a tragedy that leads a talented individual to pursue his dream. In this case, to be the best baseball pitcher in the world. But most of all, just play baseball. You follow Goro Shigeno/Honda through some rough years of his life. Battling with both injuries, tragedies and strong opponents. And they always get stronger, and the wall to climb always gets higher. And it's truly, an epic journey. There are some rough paths from little league to major league. But you quickly learn that there is no shortcut to success. So, this anime follows a storyline pattern that is proven successful by many shows before. And then it's no suprise when i tell you, i think its brilliant. They start of with a little kid idolizing his father. But when his father falls victim to a freak accident, he starts to rely on himself. And grows to be, the very talented, hotheaded and cocky main character. With one goal, to get stronger. The main character is very important in this series, more so than some of the other animes i have watched. Of course, all animes revolves around 1 or more main characters, but this series i feel is a little bit different. I can't put my finger on it, but they way they have done the "storytelling", makes me care more for this character than in any other anime. Maybe with the exception of Hajime no Ippo. Which is the only show i can compare it with, mainly because of the storytelling and the colorful characters. So, i have followed Goro though fire and ice, thick and thin, blood and sweat. And i have to be honest, i love him. I love his sincerity, his innocence and childish but cocky behaviour. His humour, his guts, his talent, his heart and his soul. And that's basically what this show is about. Pretty original, some signs of the shounen pattern, but still. It have turned it up a notch and spiced it further than anyone before them. The first two seasons were decent. But from there the quality got alot better along the lines, and the last season is magnificent. Realistic sound, alot of variation in the different scenarios. It's impressive in every way, and i can't recall that i have every noticed a flaw. This show gets top score on character, but not just because of the main character. You meet alot of interesting characters when you follow Goro, and each and one of them are unique. Of course, some of them are similar to characters in other animes. But if you add all the characters up, they deserve top score. No doubt. This show captures the nervous moment when you can decide a game, with one throw/pitch. And does it brilliantly. But the humour, the characters and the story are marvelous. I almost cried when i was finished with the last episode, and it left me with that empty hole in your heart. The feeling you usually get when you miss something and you want more. When you get that empty feeling like i just wrote about. That's a pretty good indication that this anime was superb. So, what can i say. It's been almost three months since i finished this anime, and the emptiness in my heart is still there. You want any more reasons to watch this? Major is somewhat my favorite sports anime of all time. 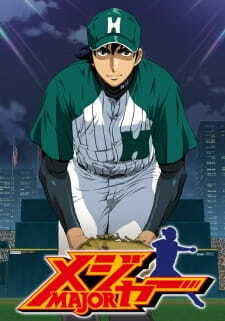 The anime is all about the struggles of Goro Shigeno, an avid baseball player, who wants to join the Majors. Baseball is actually my least favorite sport for the reason it is tedious but somehow Major makes it look fun. Major isn’t only about Baseball but it is also about Goro’s desires and struggles in his life. As Major marches onward, Goro grows physically and mentally. Major is different from sports anime who initially focuses on teams but Major focuses on Goro alone. Major is an amazing chronicle of baseball. Major has good characters. Although it is a show that is Goro-centric, it still has good development on its characters. These characters are well-made especially Goro. Goro is a stubborn man. This attitude of his never disappears. But as he continually develops, he grows into a better man. The height of his development might be in the last season when he got a psychological problem. Overall, I enjoyed Major. It is not just a simple sports anime but a character-driven one in a lesser form. I have no issues on it. Everything was simply amazing. The characters, story, visuals, music. Major is really an epitome of how sports anime should be. This is for seasons 4,5,6 epilogue and world series OVA. As I had said in my first review the first 3 seasons are appetizers, the real deal starts from season 4. These three seasons are undoubtedly right at the top of sports anime genre, treading a path very few sports anime do. Most of the anime have a school setting in this genre, while a select few like Giant killing, One outs and a few others go on to show us the professional nature of sports. And Major sits on the top of these undoubtedly. While One outs is essentially more of a thriller than real sports, Giant killing manages to portray the problems of a football manager in a professional league rather decently. But between 12 episodes and 72 episodes it isnt difficult to see which of them is more comprehensive. Also major is baseball and GK is football. major is from a players POV while the other is from a manager's. Season 4 picks off right from where S3 left. As usual things feel a little surreal and rushed, but the anime still manages to be realistic and shows a few of the basic problems someone faces when they go to an unknown country with little to no knowledge of the dialect(or language if you please). The hero is still OP but if you think he is going to breeze through everything well lets just say you might be surprised. Honestly what they show in this season has probably happened somewhere in baseball already. (Its still actually not far fetched at all since lionel messi did worse stuff in Barcelona practice to his teammates than what they show here). in what they very skilfully introduce a growth chart to the protagonist. the matches get way more intense and I can safely say I havent enjoyed baseball matches so match since One Outs, it makes Diamond no Ace matches look stupid. The matches do not drag, are finished within 2-3 episodes, and the main focus is actually more on the humans playing baseball than some tricks(there are tricks but they do not overwhelm the character interactions). Sure a bit of shouneny stuff are thrown here and there, but thats never a deterrent to the actual show. (Those who want to focus on that aspect of the show and bash it are welcome to, but tbh if you use a convex lens so much, you can pretty much give up enjoying anything). And yes this season has some of my favourite character interactions. S5 goes bigger and better. The main storyline which started from S1 becomes greatly important. And things are settled. But the drama is extraordinarily intense, and tbh I havent seen more drama in a sports anime anywhere. (maybe baby steps, but still the intensity is lower). The final game is my favourite of the entire series and the conclusion is something I did not expect. This season for me was the pinnacle of a drama sports shounen, something that cannot be bettered, ever. But this season was also about romance. Romance started to bloom slowly but surely. And it was interesting to see our protagonist juggling baseball and romance. I thought it was over with S5 but I was wrong S6 was almost equally brilliant and handled one very important aspect of a sportsman(or two), and they did it very well. They didnt overextend it and neither did they undermine its importance. The focus shifted from the games to Goro(the protagonist) as a persona and his problems, as well as his arrogance which led to his downfall. How he overcomes the odds and how his teammates get inspired from him(In fact the entire series is like that). And finally at the very last episode we get one of my favourite confessions ever. This season had splendidly done drama and showed the life of a player beautifully, the problems and the ups and downs. The world series OVA was essentially a bridge between between S6 and the epilogue, which had essentially 2 games and more of shounen sports stuff, but it is essential for a sense of completion. Finally the epilogue. The epilogue is my favourite part of the entire series. I love how they make things go the "full circle". I love how they show the protagonist grown up. I love how at the very end they show the entire 6 seasons in 5 mins while the first opening starts playing. I am a huge sucker for growing up anime, and this was the pick of the lot. I teared up at the end when they showed the entire journey of the guy. I grew up with Goro. Only flaw maybe a timeskip, but they couldnt have done a better job IMO. There are a lot of things I take back from the anime. And a lot of regrets and wants crop up. I want a love of my life like Goro had, someone to fall for me as his girlfriend did. it taught me that having talent doesnt mean anything unless you practice hard enough because somewhere in the world there will always be someone better than you at what you do. It teaches you to value your friendships. And it made me nostalgic about mine. And finally it showed how life had a weird way of repeating itself(you would know what I mean when you see the anime). tl;dr:- Incredible drama, the best baseball you will see, a story about growing up, a heart warming epilogue, thats all you need from an anime like this. the most complete sports anime ever. This anime was so good(all the seasons not just the last) that when i finished it i just sat staring at the screen because I just didnt know what to do. I am not a fan of baseball in real life but this anime is so good it didnt even matter, I didnt enjoy the first season as much because i felt like he was an annoying kid, but by the end you feel like you grew up with him and you get attached. I really enjoyed the show and i would recommend to everyone(although it is a bit long and could take a long time for people to finish). Gorou is like the perfect combination of OP yet always growing to become better. Only reason it doesnt get a 10/10 is because to me that is perfection, and I cant say this was the best ever because I havent seen them all, but i would say for me its in the top 10 of all anime i have seen.